You’re invited to Show Your Character! 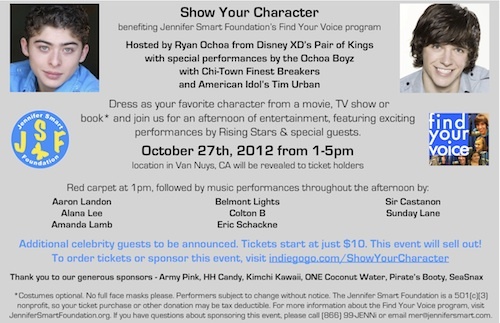 This fun afternoon, hosted by Disney XD’s Ryan Ochoa and spotlighting several young artists, include special performances by the Ochoa Boyz featuring Chi-Town Finest Breakers, and by Tim Urban of American Idol. Join us at bRgR in downtown Albuquerque on Sunday, April 22nd. Any meal you purchase at bRgR that day benefits the Jennifer Smart Foundation. bRgR features a menu full of tasty gourmet and family-friendly fare – including some more exotic offerings for the more adventurous. Try a yak or kangaroo burger, and don’t forget the sweet potato tots! You can find bRgR at 301 Central in downtown Albuquerque, corner of 3rd and Central. They are open from noon to 9pm on Sundays. Thanks to bRgR for giving us this opportunity to raise money for the Jennifer Smart Foundation through tasty meals at bRgR! I have been a supporter of Alex’s Lemonade, ever since I first met Alex’s dad, Jay Scott, in 2007. I was thrilled to be part of this wonderful event. I love talking to celebrities about their involvement with events like this, and it was great to see so many people open their hearts – and wallets – for such a worthy cause. - A Dinner and a Movie card that regularly sells for $10. Upon registering the card, you will be able to receive up to a 50% discount on movies, dining and shopping. - A DVD with a collection of my red carpet reports from the last year, including Pirates of the Caribbean: On Stranger Tides, Glee 3D, Mr. Popper’s Penguins, Spy Kids and more. Any donation is appreciated, but remember, you will receive these special gifts only if you donate $25 or more. Click here to donate. Thank you again for your support!